California shelled walnuts are available in a variety of sizes and colors. 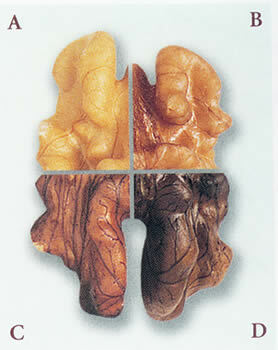 Descnptions and size tolerances are based on the USDA Standards for Grades of Shelled Walnuts. These are highlighted in green text. Also included are some size categories commonly used in the industry and these are highlighted with brown text. Screen sizes are for reference only. Consult your California walnut supplier for exact specifications. Description: 7/8 or more of the kernel is intact. 85% or more of lot, by weight, are half kernels with the remainder three-fourths half kernels. USDA Size Tolerances: No more than 5% smaller than three-fourths halves of which no more than 1 % may pass through 16/64 inch (6.35 mm) round screen hole. Description: 20% or more of lot, by weight, are half kernels (7/8 or more of the kernel is intact). USDA Size Tolerances: No more than 18% shall pass through 24/64 inch (9.52 mm) round hole of which no more than 3% may pass through 16/64 inch (6.35 mm) and of 3% no more than 1 % may pass through 8/64 inch (3.18 mm) round screen hole. Description: Portions of kernels in lot cannot pass through 24/64 inch (9.52 mm) round openings. USDA Size Tolerances: No more than 25% shall pass through 24/64 inch (9.52 mm) round hole of which no more than 5% may pass through 16/64 inch (6.35 mm) and of 5% no more than 1 % may pass through 8/64 inch (3.18 mm) round hole included in the 5%. Although not covered in USDA Standards, Medium Pieces are a common size classification used in the California walnut industry. No less than 98% may pass through a 32/64 inch (12.7 mm) screen. No more than 3% may pass through 16/64 inch (6.35 mm) screen. No more than 1 % may pass through 8/64 (3.18 mm) screen. Description: Portions of kernels in lot pass through 24/64 inch (9.53 mm) round openings but cannot pass through 8/64 inch (3.18 mm) round openings. USDA Size Tolerances: 10% will not pass through 24/64 inch (9.53 mm) round hole and 2% pass through 8/64 inch (3.18 mm) round hole. The smallest form of the California walnut comes in various consistencies ranging from a coarse meal to a fine powder. Use walnut meal to dust cakes, integrate into dough and batter, and for walnut compounds. Finely ground walnuts are incorporated into pastas, added to fillings, and used as a thickening agent in sauces. California walnuts may be color sorted to meet specific product needs. The walnut spectrum chart (for comparison only) illustrates the wide range of color classifications available. A Extra light: No more than 15% shall be darker than extra light of which only 2% (included in the 15%) may be darker than light. B Light: No more than 15% shall be darker than light of which only 2% (included in the 15%) may be darker than light amber. C Light amber: No more than 15% shall be darker than light amber of which only 2% (included in the 15%) may be darker than amber. Note: The industry standard of 6/64 is tighter than the USDA standard of 8/64. Source: USDA, United States Standards for Grades of Shelled Walnuts (Juglans regia). Agricultural Marketing Service. Effective September 1, 1968, reprinted January, 1997. www.ams.usda.gov/standards/walnuts (Adobe Acrobat format).